The other night, I had dinner with friends at Drago Centro in Downtown . Among all the wonderful wines we had that evening, 2001 Luciano Sandrone, Barolo "Cannubi Boschis" shined so much with the Grilled Piemontese Porterhouse. Although, I tend to prefer "old school" Barolo producers, I like the modern style of Luciano's Barolo also. Maybe it's because he doesn't use barrique, so you don't taste the tannins from the barrel even when the wine is young. Luciano is a suparstar of "Barolo Boys". I visited him at his winery a few years ago, and I was so impressed by the beautiful modern facilities he had. 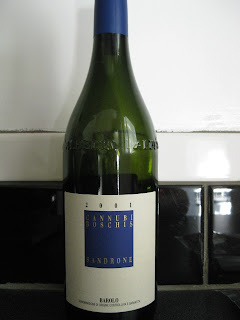 His 2001 Cannubi Boschis was still at its bright youth, yet it was well-balanced and wonderfully drinkable. The aroma had the dark berry, with a hint of mocha. The texture was dense and the finish was long. The wine coated the juicy grilled porterhouse meat so well.